Sam Bahour: Where’s My Friend? Please read and share this recent post by Sam Bahour, a well-known Palestinian-American businessman who lives in Ramallah. For more information, check out his blog, ePalestine. My friend is Walid Abu Rass. He is the Finance and Administration Manager for the Health Work Committees (HWC, at www.hwc-pal.org), one of the largest community health service providers in the occupied Palestinian territory. HWC serves over 500,000 patients/beneficiaries per year! More on HWC in a second. I had not seen Walid for a while. We are both knee deep in Palestine’s daily rat race. About two months ago, Walid and his HWC colleagues called for a meeting of their circle of friends. They sought assistance. HWC was going through some financial hard times, especially with the financial crisis in Europe, where many of their donors are based. Given it was close to the end of year, a season when I usually donate some time to assist a community based organization to fundraise, I offered to volunteer. Walid was my counterpart. During the past weeks, we were in daily phone and email contact, and every few days we met up to visit a potential local donor. Progress was being made. We then started to plan, with a few others, an end-of-year fundraising raffle. Plans were coming together, and there was excitement among the team and staff that we were taking our fundraising needs to our local community to compensate for the loss in European institutional funding. This is even more significant since HWC does not accept funding with strings attached (“conditional donor funds”), so they have to struggle just to keep the doors open in this tainted donor-driven market. For nearly a week I was emailing Walid with no reply. This was not like him. He and I nearly live behind our keyboards. The deadline for the raffle details was rapidly approaching and if we did not get started, we would miss the end of year opportunity for fundraising. I started to think Walid was mad at me for some reason. I rethought our last few weeks of working together. There was absolutely nothing there to cause him to just ignore my calls; after all, I was his volunteer counterpart. Then, last night I learned why Walid stopped replying to me. On November 22nd, Israeli occupation soldiers arrived at his home at 1:30 A.M. Walid lives in Ramallah with his wife, Bayan, and two daughters, Mais, 13 years old, and Malak, 4 years old, who were all frighteningly awakened during his arrest. Walid was taken into custody and transported in the bone chilling cold of the night to Israel’s Ofer Military Detention Center where hundreds of Palestinians are detained, the vast majority with absolutely no knowledge of why. The Israelis have been arresting Palestinians nightly for years now. Israel releases a few hundred prisoners in a media frenzy and then, the same night, starts to refill its prisons, a few Palestinians at a time. Although, as per the Oslo Agreements, the Palestinian side is responsible for security inside the Palestinian cities, Israeli armed forces routinely—read nightly, every night—enter the cities in their armored vehicles in the middle of the night and arrest a dozen or so Palestinians from their homes. Walid was merely the latest victim of this kidnap-by-night strategy. The routine then goes something like this. Within eight days he will be brought before an Israeli military “judge” for the sake of processing only, not deliberating. The entire kangaroo court then, without sharing the reason why the Palestinian detainee is being held, flashes the security card to justify not sharing information on why they have acted against a specific individual. Then the court slaps a six month Administrative Detention Order on the detainee. That means you sit in prison for six months for no reason at all. Walid has already been given just such an order. Your wife, your children, your work, your end-of-year fundraising campaign, your 500,000 patients/beneficiaries, your life, all abruptly stop. Then, usually, that six month order gets extended a few times before you are released. Walid is not unacquainted with this Orwellian mess. He previously spent nearly five years in and out of detention, never once being charged with anything! The Health Work Committees association is registered as a not-for profit organization with the Palestinian Ministry of the Interior and also has a Jerusalem registration since they work in Jerusalem as well. HWC employees over 300 persons and operates 14 clinics throughout the West Bank, providing primary health services via these health clinics, mostly in areas not fully covered by the Ministry of Health. HWC also has a community development aspect of their work and operate the following: Jadal Center for Culture and Social Development, Nidal Center (providing health education to East Jerusalem schools), Community Development Plan, Oasis Rehab Center, Community Based Rehabilitation, and the Elderly Care Nursery and Kindergarten. One of the success stories of HWC is its partnership with the Dunya Women’s Cancer Clinic. All of these activities need health care administrators, of which Walid is one. At a time when the Israeli closure system is making life hell for Palestinians, especially those living in marginalized areas or areas directly affected by the Separation Wall, HWC is needed more than ever. Likewise, at a time when international organizations, like USAID, have dramatically cut funding and laid off staff from their heath care programs (such as Flagship) as punishment to the Palestinians for pursuing membership in UNESCO, HWC’s services are needed more than ever. The era of silence is over. Also, over for me are the slogans that can’t be operationalized. Yes, we want all 5,000 or so Palestinian detainees released. Yes, the policy of administrative detention is inhumane and must end. However, these slogans, although needed at times, must be matched with action items. Each life being destroyed by the Israeli revolving door policy of detainment is a person with a name and a family and a job. And when the person is my friend or colleague, I refuse to swallow the fact that Israel has carte blanche to act above the law. 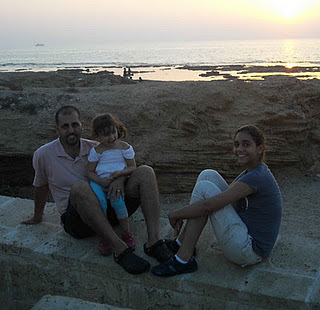 Help me get Walid back to his family and his desk so we can get back to the work of improving the Palestinian health care system. Consider contacting your local Israeli Embassy and any or all of the following and demanding his immediate release. Reference his name, Walid Abu Rass, and his ID # 9-9702819-6. For more information on Administrative Detention see ADDAMEER (Arabic for conscience) Prisoner Support and Human Rights Association at www.addameer.org. This entry was posted in Human Rights, Israel, Palestine on December 11, 2011 by Rabbi Brant Rosen. Thanks for sharing this story, R’ Brant. Having read Alan Hart’s three volume work on Israel/Palestine, I believe his conclusion that with the 1967 War, the West Bank was meant to be slowly absorbed into Greater Israel. The continuing settlements prove this theory. But what to do with the Palestinians who cannot be voting members of the larger Israeli state? How about making life miserable for them to the point they will voluntarily leave the West Bank. Hassle the Palestinians for no reason, attack their mosques, cut off their water. Isn’t this the situation poor Walid is caught up in? Robert, the 1967 war, what led up to it and what followed it is something I have studied extensively and deeply. Of course the intention was and still is to slowly absorb the West Bank into Israel then get rid of the inconvenient Palestinians by making life untenable for them, The process began immediately with very systematic, calculated, and in some cases brazenly open ethnic cleansing of certain key areas not only in The West Bank/East Jerusalem, but also in Gaza. The Alon Plan was delivered in July, 1967 mere weeks after the war. If you look at the pattern of creation of “facts on the ground” in the West Bank/East Jerusalem, it is quite consistent with the Alon Plan. And the Golan Heights is worth mentioning here. The Israelis began their efforts there with very systematic, selective ethnic cleansing resulting in the involuntary exodus of more than 95% of the Syrian population, and the destruction of 95% of the villages and small towns – their most successful ethnic cleansing effort to date. They selectively expelled “Arabs” – aka Muslims – and allowed some Druze to remain in place because the Druze religion mandates that Druze accept and cooperate with whomever is in power. That has not worked out as well as the Israelis expected, but they have managed to successfully squelch most resistance, and perhaps even more importantly, keep their blatantly illegal actions in the Golan mostly out of sight.